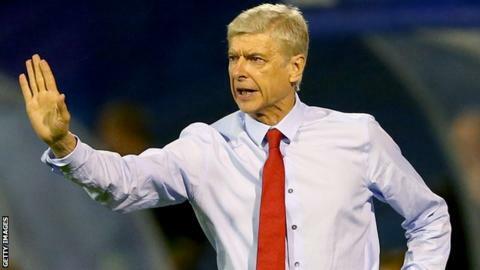 Arsene Wenger has criticised Uefa's drug regulations, saying current rules "basically accept doping". The Arsenal manager's comments come after Dinamo Zagreb's Arijan Ademi was banned for four years for failing a test after his side's Champions League win over the Gunners in September. Dinamo have not been disqualified from the competition as regulations state two or more players must test positive before that punishment is considered. Wenger said the rule was "surprising." The Uefa regulation corresponds to the World Anti-Doping Agency's (Wada) guidelines but Wenger said: "I personally don't agree with the rule. "You cannot say that they had a doped player but the result stands. "That means you basically accept doping. But it is the rule and we accept that. We have to look at ourselves and deal with our own performance." Arsenal need to beat Zagreb at home on Tuesday to keep alive any hopes of making it to the knockout stages of the Champions League. Wenger, who has spoken out on several occasions on drug issues, revealed that doping control officers from Uefa were present at the Premier League club on Friday. The Frenchman's comments on the regulations brought a response from European football's governing body, and in a statement a spokesperson said: "Uefa's anti-doping regulations regarding the consequences for teams for doping offences are strictly in accordance with article 11 of the Wada code that states that 'where more than one team member in a team sport has been notified of a possible anti-doping rule violation, the team shall be subject to target testing for the event. "If more than two team members in a team sport are found to have committed an anti-doping rule violation during the event, the team may be subject to disqualification or other disciplinary action." Dinamo Zagreb coach Zoran Mamic responded to Wenger's comments, saying: "Mr Wenger can think and talk about what he wants but there are other people who make decisions about that and that will be in the future." Macedonia midfielder Ademi, 24, is appealing against his four-year suspension, announced on 20 November.